Perhaps it’s the case of the present Government inheriting the past Rajapaksa regime’s SAITM sin. But those who coveted the crown must also bear its encrusted burdens and cannot casually flick the buck back to the past and cleanse itself of the original folly, even though it’s not of their own making. But whilst the coalition government, playing surrogate mother, is busy trying to defend the private medical college it was bequeathed with, so is the Rajapaksa joint opposition heavily engaged in attacking the very institution it delivered into existence as its omnipotent mid wife. And ‘what a tangled web’ the joint opposition perforce must weave when they now ‘practise to deceive’, finding that changed circumstances have placed their SAITM shoe on their other lame foot. On Wednesday, the ever willin’ porter Peiris, ever ready to carry the Rajapaksa baggage, who as Mahinda’s Foreign Minister was sent to lie abroad in Lanka’s interest, came forward as the Joint Opposition’s High Priest at the Oracle of Delphi not to prophecy the future but to add new spin to the past and explain away the rotting carcass in Rajapaksa’s interest. The South Asian Institute of Technology and Medicine (SAITM) was established in 2008 during Rajapaksa’s first term as president. 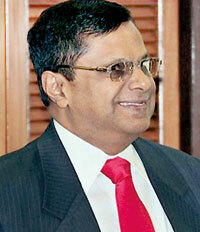 In his second term of office, the University Grants Commission in 2013 awarded SAITM the right to award degrees. In May 2016 SAITM conducted the final MBBS examinations for the first intake of students. In June last year Dhilmi Suriyarachchi, who had been conferred with an MBBS Second Class Upper Division Degree from SAITM on June 1, 2016, petitioned the Court of Appeal through her lawyer, President’s Counsel Romesh de Silva. Two weeks ago, the Court of Appeal delivered its judgment. President of the Court of Appeal Justice Vijith Malalgoda and Justice S. Thurairajah held that an MBBS graduate of SAITM has no obstacle to register at SLMC as a medical practitioner in terms of section 29 (2) of the Medical Ordinance. The judgment further held that n on or around August 30, 2011, the former Higher Education Minister recognised SAITM as a degree awarding institute in terms of section 25 (A) of the Universities Act 1978 and that the Higher Education Minister has not taken any steps to revoke the concerned decision in terms of the section 27 of the said Act. the SLMC had acted in violation of section 19 of the Medical Ordinance when making regulations relating to SAITM. The SAITM is empowered to grant MBBS degree. But instead of bowing down to the Court of Appeal decision, as all citizens and litigants must whether it is in their favour or not, the onetime professor of all laws was busy writing his own judgment, now that the established judiciary had delivered one contrary to the political stance of the joint opposition. At Wednesday’s press conference, asked why the Rajapaksa joint opposition were so against SAITM when it was started during the Rajapaksa era and the right for it to award medical degrees was given to it under the auspices of the Rajapaksa regime, the porter of all Mahinda’s baggage rose sheepishly in his master’s stead to wolf out his own discredited and contemptuous academic opinion, tainted as it is now with bias of Rajapaksa infallibility. Then he is asked about the ludicrousness of Mahinda Rajapaksa conferring scholarships to students to follow the degree course at SAITM if his government did not recognise the legitimacy of the degrees obtained? Were the students led up the garden path to follow a degree course, through a maze of political masquerades only to end up at base zero where they started from? His reply is revealing for the convoluted and warped way a once brilliant academic mind works when it has taken the perverse political road and stumbled into the gutter; of how independent thought turns servile when the soul turns slavish and pathetically attempts to wash in public the muck off its worshipped hero. “We don’t accept that. The awarding of a scholarship by the president to follow a degree course at a certain institute is different from whether that institution is qualified to grant a degree. The scholarship is granted to the student to follow a degree course in that institution. The SLMC published ads in the papers that the degrees will not be recognised. The students should have known of that.” Is Peiris saying that his idol shouldn’t have known better when he awarded scholarships to students to follow a degree that will get them nowhere? Is that another instance of dreams frustrated and efforts wasted? Then even as Peiris tries to wash the Rajapaksa hands clean of any involvement, there is another question that was not asked but needs to be raised now: Why did the Rajapaksa government extend a loan of Rs. 600 million from the state banks to SAITM in 2011 without first verifying that SB’s order was first complied with by SAITM? If that was the nerdy Peiris talk in response to a Court of Appeal judgment, then what of the arrogant conduct of the Government doctors’ union, the GMOA that is fast cultivating a thuggish roadside manner that gives short shrift to another’s opinion – even if it’s the Court of Appeal’s considered judgment – if it does not tally with the intransigent stance of its own? They took their brawl to the streets with intent to shake the pillars of Demos’ edifice and force the hand of the president to renege on his promises to the people to establish just governance where the judiciary will be held with the utmost respect. Two days after the court of appeal judgment, medical college students launched a protest march in the city. This was no protest against the government for taking a political decision not to their liking which is legitimate in any democracy but a protest against the entire judiciary for daring to give an independent ruling not in their favour: An extrajudicial exercise to coerce courts to rubber stamp their views. The ultimate affront and threat to law and order and to the majesty of the courts. And when the protesters attempted to storm the barricades erected by the police to prevent them entering the road to the Presidential Secretariat, and the police had no alternative but to take recourse to teargas and water cannon, the GMOA shouted blue murder and launched a street protest of their own the following day and a hospital strike the day after. 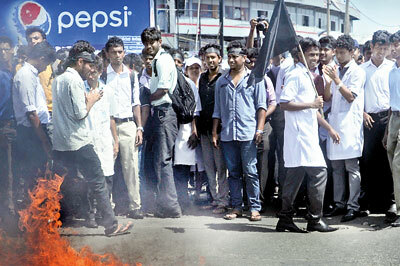 The street protest was to protest against alleged police brutality against the medical college student protesters. The other was to boycott all hospitals island wide, save a few, last Friday leaving thousands of patients helpless and denied medical treatment and put at risk. In the unfolding drama of medical madness in taking to the streets to protest against a verdict given by the Appeal Court simply because it did not match the same tenor of their opinion, only the SLMC retained an iota of sanity by stating last Wednesday that it intended to appeal to the Supreme Court, which is the proper and sensible thing to do, if one is unhappy with an appellate court’s order. Now the GMOA has announced its intention to meet President Sirisena to ask for his intervention to give effect to their demand to ban SAITM students from registering at the Medical Council. But they will not be attending the meeting with their stethoscopes harmlessly dangling around their necks. Instead they will come armed with the noose of the strike threat to paralyse all hospitals and, with the intent to go for the jugular, will place it around the presidential collum in the hope that the president will be choked into submission and will relent to accede to their demands. President Sirisena has also conveyed his plan to summon all stakeholders involved in the SAITM Medical College issue for a decisive discussion to resolve the crisis, Minister Mahinda Amaraweera told Parliament on Thursday. But how can the President overturn a decision of the second highest court in the land? This is not a simple case of casting aspersions in public and hoping the message will get through, as what happened when he criticized the former Bribery Commissioner and questioned the propriety of her actions in filing indictment in court against people he considered important without his prior consent which led to her resignation. This is to override a judgment issued by the second highest court in the land to a citizen who prayed before its altar for justice and received it in full measure. But, of course, the president can overturn a decision of the courts by orchestrating members of his coalition government to rush through a bill in Parliament to render null and void the decision of the Appeal Court. But that’s a drastic measure. And would be an extremely short sighted one. If his government, that came to power with the pledge to restore confidence in the independence of the judiciary, now resorts to undermine the judgments of the courts to gain temporary political mileage merely to satisfy the political demands of a trade union that threatens strike action because the courts ruled against their wishes, it will be to open the flood gates to every trade union in this county to achieve their demands not through the temple of justice but through the rear door of political power simply by taking their objections to the street and threatening strike action. Justice then will no longer be the province of the courts. And the temple of justice will be rendered redundant, with its iconic statue of Justicia smashed to smithereens along with her scales. The streets will decide the merits of a case based on the political advantage to be obtained for those who have the political might to wage their battle on the road of anarchy. What must be understood clearly is that the GMOA has elevated the whole SAITM issue to another plane: whether street warfare rules over the rule of law and the supremacy of the courts. The solution is, as the SLMC has announced it intends to do, is to appeal to the Supreme Court and wait their judgment and abide by it. And as for the GMOA, isn’t it unfair, unreasonable and audacious of them to ask the president of the country to perform the practically impossible and commit the politically suicidal? It is also an opportunity for the GMOA and all those who decry the presence of foreign judges on the war tribunal and blare instead their supreme confidence in local judges, to express their solidarity with the decision of the totally home grown bench on the Court of Appeal and obey the independent judgment tendered. And as for the president, if he succumbs to GMOA pressure and decides to override the Appeal Court’s judgment, he might as well ask for the rope the GMOA will proffer him when they next meet and place it around his cervical vertebrae and kiss his political future goodbye. Strange, isn’t it, that the GMOA, while it professes tender loving concern and care for their future patients and says it will stand to protect patients lives at any cost, have no qualms in putting at risk the thousands of patients in government hospitals right now under their care? That in the pursuit of achieving their political demands, they see nothing unethical, nothing immoral, nothing wrong in callously holding their present patients – unfortunate as they are to have fallen sick in the first place at this particular time – as hostages and have no scruples about holding a double barreled strike gun to their heads and threaten to pull the trigger if the government fails to take the steps they demand to negate the judgment of the Appeal Court? Wonder what the general public have to say on this matter? Would the GMOA blackmail go gently down their duodenal tube or would it give rise to ulcers of disgust and hate towards government doctors who are prepared to put at risk their lives at the drop of the hat to advance their own agendas? To use them as dispensable pawns in the battle to checkmate the 60 SAITM graduates from registering with the SLMC as granted to them by the Courts? The GMOA has long ceased to be a professional body and its present chieftains have sought to turn the combined might of 17,000 doctors of a once hallowed profession sworn to a sacred oath to place the welfare of patients above all, including their own monetary well-being, into a political tool possessing the potential to kill, even cause mass murder. The politicization of the organization is now complete. It has shown they are even prepared to rebel against the second highest court in the land if it does not deliver judgments according to the GMOA’s dictates. Far better for the GMOA to shed the sham and seek registration as a political outfit. And take the ‘Hypocrite’ Oath as all other political tribes do. At least then they will be more honest, even though heartless. For the whole of last week medical college students attending the 8 medical colleges in the country boycotted their lectures in protest over the Court of Appeal’s decision to empower SAITM medical graduates with the right to register at the Sri Lanka Medical Council. These doctors of the future were taking their cue from the GMOA doctors of the present. They were learning young from this body of physicians, the fine surgical art on how best to cut the nose to spite the face. Last Wednesday, they had taken to the streets in protest. Ever since that day they had kept off from the Groves of Academy and exchanged the priceless opportunity of gaining knowledge – paid for by the public – in return for political rhetoric parroted by the elders in the profession into whose shoes they intend to step. But have they paused to think, who the real losers are? They have been blessed with the knowledge gifted by the public throughout their schooling years to achieve the Z score level at the A’ levels to gain admission to one of the medical faculties in the country. But they have scored zero when it comes to common sense and minus when it comes to gratitude towards the people, the general public of this country, who have financed their education to place them in their seat in these hallowed halls of learning to become the earthly gods of health in the future. There’s no such thing called a free lunch. Or, for that matter, a free medical qualification. Someone, somewhere, has to pay for it. In their case, it’s the general public who foot the bill to educate an unknown youth at great sacrifice. In a SAITM student’s case, it’s his or her parents who provide the means also at great sacrifice. Boycotting lectures that the public taxpayer pays to give them, is to slap the benefactors in the face: it is to spurn the pearls of education freely given unto them. But they have proved one salient point. That anything given free on a platter is rarely appreciated. As the medical students at the 8 government medical faculties have demonstrated these last 11 days, it only affords the opportunity for one to become the spendthrift of another’s generosity; and to squander it on some political misadventure, gives no rise to questions of conscience or guilt. Especially when the belief holds that its manna from heaven; when they fail to realise that time and tide and the season to learn wait for no genius, least of all a dumb cluck, for whatever political reason. Gee. No need to say cheese. The spontaneous smile says it all. This is the happy face of the man whose name is Obama. Barrack Obama. Enjoying a little piece of heaven and flashing his ivory to show the world he’s enjoying every moment of retirement bliss. He’s the chap, remember, who did his stint, double time, working his gut out as the President of the United States of A, the world’s most powerful man from 2008 to 2016. Now, having come to the end of the nation’s two-term tether, and handing over Liberty’s torch to the next in line, he dashed off to get his share of sun, sea and sky on Richard Branson’s private island off the coast of the Virgin Islands. Now free at last to fly kites in the sun and scale the sky in blissful paradise. And turn and say to his wife “Meshells sea shells swell on the sea shore’ a thousand times and one as his mantra to gain bliss on ground zero. Happy flying sky high Mr. ex President. There’s more to life than just being a demi god for ever. For, power in a man’s breast, is but a guest that leaves without notice.